The Hidden-In-Plain-Sight Ranch celebrates the return of one of their own, resistance leader Alanna Sharpe, from her trip through Hell. With her comes her long-lost father, Cole, to fight alongside his family for the survival of all supernaturals. Two tasks remain for Alanna and her friends, however. Her mother Ariel remains captive, and waits for revolution or rescue to set her free from her technological prison. Alanna's supernatural brethren also remain under the thumb of the New Empire of America ... which is massing now for one final siege to commit the unthinkable: destroy Avalon with the fearsome power of the Damnation Blade, a weapon forged in Hell from the blood of Lucifer himself. Will Alanna prevail, or will she ... along with all supernaturals and the entire world ... perish under the threat posed by the Regents, the SSA, and the New Empire's hellish rise to power? Don A. Martinez, the son of two 20-year Navy veterans, holds a Bachelor’s degree in writing and a Master’s degree in English from Buffalo State College with an academic focus on myth and folklore, and is a college instructor in Texas. He has a wife, daughter, and four cats. Eden Inviolate was published July 4th, 2014. 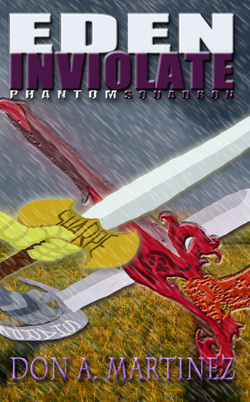 It is the fifth and final book in the Phantom Squadron series, and the sixteenth book produced by Desert Coyote Productions.